TGIF, rush hour road rule tips and weekend festivites! “Tick tock, Tick tock,” goes the clock as you wait in anticipation for five o clock to be here. It is finally Friday once again and the week has been anything but pleasant. As we wait for the end of the day to arrive to rush out the door, remember, it is important to get home, safely. Don’t tailgate and remain a safe distance between the car in front of you. Don’t swerve into other peoples lanes. Click it so you wont get a ticket! Make it there on time as Free t-shirts will be given out to the first 25 people participating in show. Blick Law Firm hopes to reach out to the surrounding community and promote to those with any legal needs in personal injury, criminal law and real estate and bankruptcy. 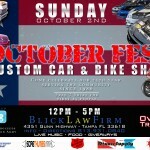 For more information contact Dana Blickensderfer at dana@blicklawfirm.com or call 813-931-0840. 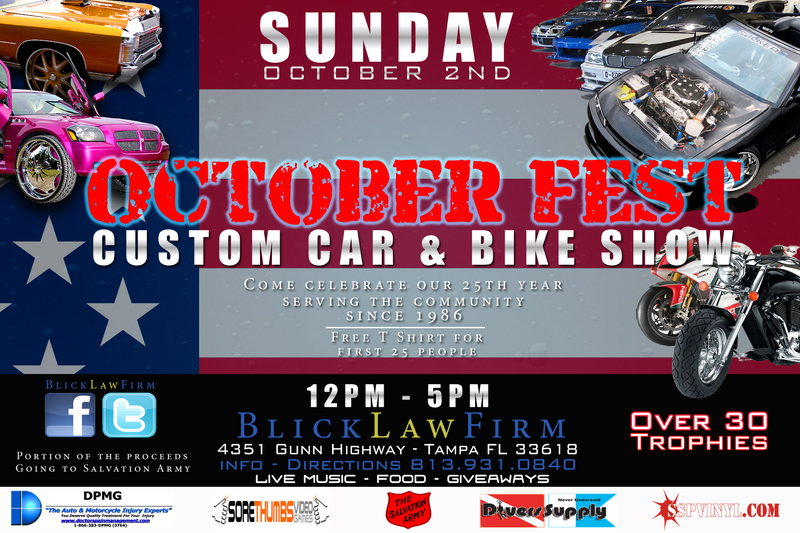 This entry was posted in Blog, Personal Injury and tagged bike and car show, blick law firm, rush hour traffic tampa, tampa bay safe driving, tampa persoal injury. Bookmark the permalink.